Albums / culture / Just a word. / Local Love / music / Words. 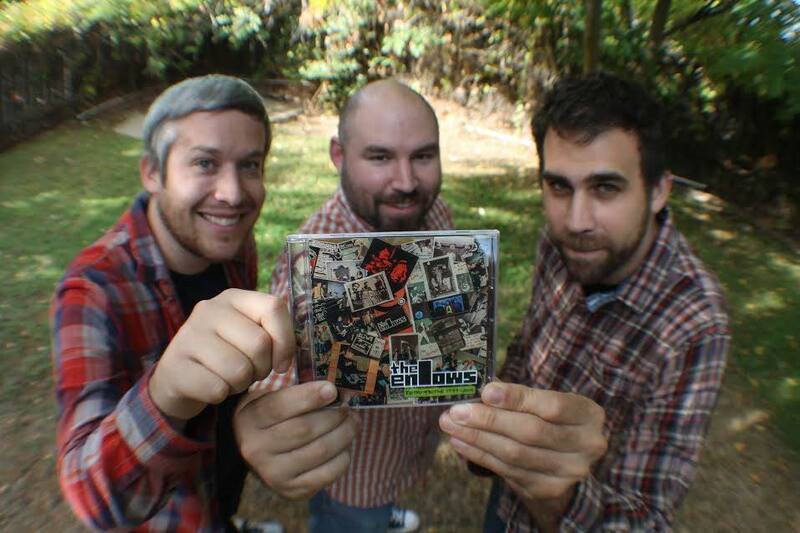 Music We Believe In and a Solid Performance: The Enlows Turn 15! The Enlows. Photo Matt Bennett. Do you remember turning fifteen years old? Being pissed off at your folks? Having baked, greasy skin like last night’s pizza, perhaps? Losing control while making a valiant effort at conversation with a crush? ¿La quinceañera, puede ser? Rock bands have an advantage over us as individuals – those embarrassing things do not happen to a band. Especially the bands that are lucky enough to turn such a wise old age, like Sacramento’s The Enlows. The band came together in high school, took its moniker from the last name of one of its biggest supporters, and for its fifteenth birthday released its first official CD in the “retrospective” format, usually reserved for last hurrahs and the final coda. Thankfully, The Enlows are only getting started. Never underestimate the power of black leather jackets. It has been a busy past few months for guitarist/lead vocalist Ry Arwai, bassist Ryan Garcia, and drummer Jeff Melendez. They concluded their fifteenth year together by releasing the 32-track smorgasbord Retrospective (Outloud! Records 1999-2014). Limited edition cassettes, 7-inches, and burned CDs have been officially and unofficially released, but Retrospective collects all of those previous releases and presents a history of the band, its many line-ups, and recording situations. Some of the tunes are aggressively lo-fi and others sound ready for rock and roll radio. Listeners will be treated to the band’s true love of different sounds, styles, and moods. TUBE. Magazine had the chance to catch up with all three members over pizza and beer just before they learned that they had been nominated for three 2015 SAMMIE Awards (Best Punk Band, Band of the Year, and Album of the Year). Go Enlows! Why a retrospective for the first official CD release? Ryan: We have a vault of material that hasn’t seen the light of day, so we wanted to get it out for the people. Ry: There are a lot of very limited releases out there, and we thought it would be nice to have one place to go to get it all. The fact that it had been fifteen years made it feel like the right thing to put together. Ryan: We even have three unreleased albums. The first was recorded in 2001, a live album was recorded at the Cozmic Café quite a few years later, and then there’s the album we’ve been recording for more than two years but still haven’t finished. What was the philosophy of the band in the beginning? Has it changed at all in 15 years? Ry: Our philosophy hasn’t changed. If people like it, that makes us happy; if people don’t like it, that doesn’t make us unhappy. Ryan: People get older; audiences change; musical tastes change. It’s never been a factor for us; it’s always been about the music we believe in and a solid performance. Jeff: From then to now, it’s been the same thing: we still rehearse in a bedroom, we record ourselves…I wouldn’t say that it’s changed. But it’s blossomed and been enriched. What were the early gigs like? Ry: Most of them were at the old Capitol Garage on L St., not realizing that its sound guy (Jeff) would eventually join the band. Ryan, Gabba (an early Enlows drummer/current singer & guitarist of The Croissants) and I were just high school kids from Elk Grove excited to be playing downtown. We got to play with a lot of really talented musicians of the time. There was such a great scene of people that came out to every show, no matter who was playing. Besides bands, who or what inspires you artistically? Jeff: One name – Rambaldi. Ryan: Pro video gamer (and star of King of Kong) Billy Mitchell. His quest for perfection in all that he does in video games is something I wish to attain in my own personal bass playing. Who have been some of the band’s biggest supporters? Ry: This guy right here (pointing at Ryan). He’s our Paul McCartney. Also, all the musicians we met during the Capitol Garage times that went out of their way to introduce themselves, and talk about music, and talk about what we’re doing. We’ve had the opportunity to play with lots of really great bands, and the people that make up those bands are what make the bands great. Ryan: A lot of the people that we met back in those days—like Danny Secretion (Secretions/Knockoffs/The Moans), who invited us to play a lot of shows, and Ted Angel (Mallrats/Mr. T Experience), who we’ve just recorded with—all of these people have helped out in so many different ways, whether they know it or not. Jeff: More recently? Matt Bennet (founder of Outloud! Records/singer & bassist of The Moans). Matt is the guy every scene needs: he makes flyers, he releases music, he rallies around everyone. Talk about the CD front- and back-cover layout. Do all of those pieces of Enlows memorabilia belong to one of you, or is it a collective effort? Ry: All of those pictures are pulled together from all of us, so there are all sorts of different sources. It’s not a Photoshopped collage because it is a real photo of all these items placed next to each other, but it was Photoshopped. Jeff: To reveal Ry’s trickery, the right side is actually the left side of the collage we laid out. But it’s a retrospective – let’s throw it all out there, visually, about who we are as a band. Ryan: The story we’re trying to tell here is that in a fifteen year run, here is a sample of everything that makes up that fifteen years. You’ve got every release that we’ve put out on this collage, you have photos, flyers, buttons, stickers, lyrics, notes for a concept album we were writing…It’s a complex story we’re trying to tell with many layers. If the Enlows could open for anyone, who would it be? Ry: We already had the opportunity to open for that band: The Queers. That was one of the greatest things to ever happen to me. Jeff: The Weird Lovemakers and FYP is a dream situation because those bands aren’t around anymore. Ryan: Because of my teen years of going to shows, and it’s a band I’ve always loved – The Groovie Ghoulies. A Sacramento institution that I’d love to open for but never will get to do. I know their catalogue back to front, and we once played an acoustic show with Kepi, but it just wasn’t the same thing. What is something the band has not yet accomplished that you’d like to achieve before it’s all said and done? Jeff: Record a full-length record and release it. Ryan: Play a show at the Crest Theater. If I can do that, I can walk away from it and just say, “I’m done.” Some of the most impactful shows I’ve seen were there, like the time I was two feet away from seeing Weezer play. I’ve always wanted to recreate that for someone else in that position. Ry: I’d like for The Enlows to be Spiderman’s best girl Mary Jane Watson’s favorite band; that would be amazing. They could write it into a movie or the comic! Anthology may be purchased online at The Enlows website or in person at Phono Select Records, 4320 24th St., Sacramento. The Enlows will be rocking out on March 26 at the Blue Lamp with The Moans and The Croissants and April 3 at the Café Colonial with The Harbor. Tags: 15th Anniversary, Album of the Year, Band of the Year, Best Punk Band, Billy Mitchell, Black leather jackets, Blue lamp, Cafe Colonial, Capitol Garage, Cozmic Café, Crest Theater, Danny Secretion, elk grove, FYP, Jeff Melendez, Kepi, King of Kong, Knockoffs, Mallrats, Mary Jane Watson, Matt, Matt Bennet, Matt Bennett, moans, Morgan Giles, Mr. T Experience, Outloud! Records, phono select records, Rambaldi, Retrospective, Ry Arwai, Ryan Garcia, SAMMIE Awards, Secretions, Spiderman, Ted Angel, The Croissants, THE ENLOWS, The Groovie Ghoulies, The Harbor, The Queers, The Weird Lovemakers, tube magazine. Bookmark the permalink.